A key scene in the “Backpack Full of Cash” video includes Union City Public School in New Jersey as a successful example of what public education can look like void of charter school privatization, and if communities invest resources into their public schools. This scene is a strong counter-example to the film’s earlier assertion that due to an increase in charter schools, mass school closings in low income neighborhoods affect predominately people of color. This is because the opening of charter schools works to syphon off the wealthy students from public schools, leaving low attendance and minimal resources in these neighborhood public schools. Yet by using the example of successful Union City Public School, the filmmakers are able to present the plausible, healthy, and apparently doable alternative of investing in low-income public schools to make them better rather than in charter schools to “change” the system. In fact, it is this assertion that we ought to invest in the quality and resources for public schools and not privatized charters, that the film is centered around. The scene mentioned above shows a traditional urban public high school that, due to a city’s commitment to rebuild and strengthen existing schools, is thriving. Students are receiving a high quality, hands-on education from which many continue on to attend highly selective colleges and universities. The film also describes the resources that these public high school students have at their fingertips as a result of a community that invests in its public schools: a daycare center, social workers, and a clinic with free health care to name a few. This example is integral in creating a convincing argument backed by evidence that the solution to this country’s education gap is to invest resources in public schools. Without a successful example of one such school, the argument would be far weaker. 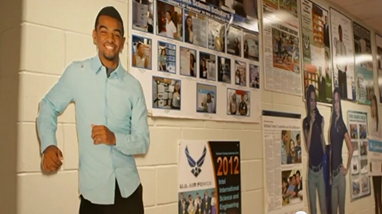 Furthermore, in shooting this scene filmmakers capitalize on pictures of students committing to institutions such as the Air Force Academy, shots of impeccable student artwork (shown below), and a personal testimony from one low-income Latino boy with a success story due to his high school. 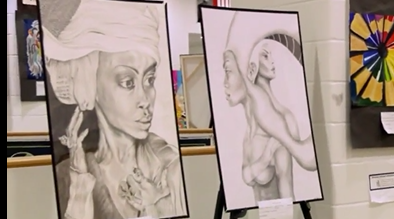 By highlighting the best and brightest of the school, filmmakers are able to successfully juxtapose this public school to those without significant funding from their community. Such an approach allows for the argument that all school districts should be doing this for their students. While this film poses some very compelling scenes, there are also voices that are left unheard. Parents, students, and faculty from public schools are given a voice, as are students from charter schools, but one important group of individuals that would have helped the film’s argument are left out: families who were steered away from charter schools due to race, income, or educational needs. The addition of these stories would have created an even more powerful argument, rather than simply hearing about the phenomenon of students being indirectly (but intentionally) selected out of charter schools for such reasons from professionals. In addition, the stories of low-income families and children at risk for future failure in an inequitable school system (such as those described in detail in Paul Tough’s Whatever it Takes: Geoffrey Canada’s Quest to Change Harlem and America) who benefitted largely from privatization of education are not included. In order for it to be a fair and equal assessment, such stories should have been highlighted to show the advantages of charter schools. So too should have the stories of charter school entrepreneurs such as Geoffrey Canada been told, who went into school privatization with the sole intention of helping the very marginalized communities that this film claims charter schools harm (Tough). Although the film shows a passionate stance in its argument against school privatization, there are stories that should have been included, which are not, in order to make the claim that it poses a holistic view of the issue. Mondale, Sarah. Backpack Full of Cash. 22 Oct. 2016. Tough, Paul. Whatever It Takes: Geoffrey Canadas Quest to Change Harlem and America. Mariner Books, 2009. Next Next post: Backpack Full of… Deprivation and Discrimination?